A timer on-delay (TON) instruction is a programming instruction used to delay the start of a machine or process for a set period of time. A TON instruction starts timing when the logic preceding the TON instruction on a rung change from false to true. When a TON instruction starts timing, the accumulated value begins to count time base intervals until the accumulated value equals the preset value. When the logic preceding a TON instruction changes from true to false, the TON instruction stops timing and the accumulated value is reset to zero. 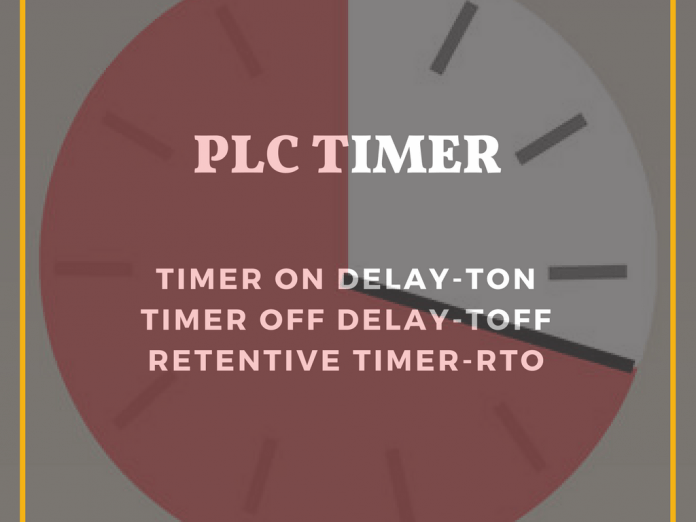 A timer off-delay (TOF) instruction is a PLC programming instruction used to delay the shut down of machinery, such as an external cooling fan when a motor has been stopped. The accumulated value begins to count time base intervals until the accumulated value equals the preset value. When the logic preceding a TOF instruction on a rung changes from false to true, the TOF instruction stops timing and the accumulated value is reset to zero. A retentive timer (RTO) instruction is a PLC programming instruction used to track the length of time a machine has been operating or to shut down a process after an accumulative time period of recurring faults. 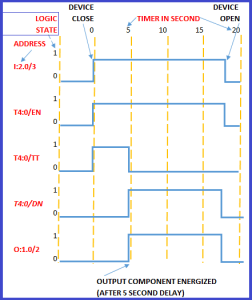 A timer starts timing when the logic preceding an RTO instruction on a rung changes from false to true. When an RTO instruction starts timing,the accumulated value begins to count time base intervals until the accumulated value equals the preset value. When the logic preceding an RTO instruction on a rung changes from true to false before the accumulated value equals the preset value, an RTO instruction stops timing and the accumulated value is retained. 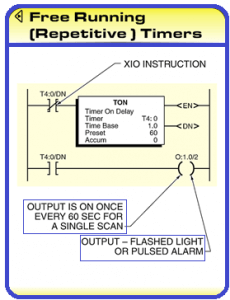 A free running (repetitive) timer is a type of programmed timer that is continuously timing because the XIO instruction preceding the timer is true. When the accumulated value of a free running timer reaches the preset value, the instruction preceding the timer goes false, the timer is reset, and the timer starts timing again on the next scan (when the XIO instruction is true again). Timers are cascaded by having the DN bit of timer #0 activate timer #1. 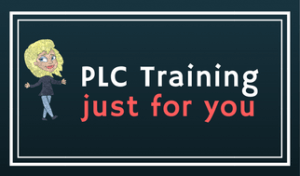 The only limit to the number of cascaded timers is the size of the memory in the PLC. Cascaded timers are used when individual timers do not have enough time base intervals for an application. For example, an individual cascaded timer cannot be programmed for an operating time period of 45,000 sec because the maximum preset and accumulated value is 32,767 sec. However, two cascaded timers can be used to program a time period of 45,000 sec for the next bypass flushing. Cascaded timers can also be used to start equipment sequentially, such as when starting three conveyors with a 10 sec delay between the start of each conveyor. See Staggering the starting of the conveyors limits the amount of inrush current that must be carried by the electrical distribution system of a building. 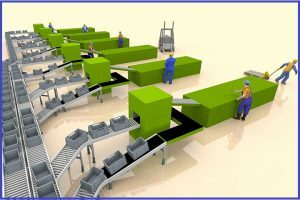 Staggering conveyor starting also ensures that a conveyor is running before the conveyor receives product from another conveyor.